June has arrived, stormy and unsettled. Heavy rain. Bursts of sunshine. The rich colours of early summer. The ground wet but warm. After too much time indoors in meetings (with the John Muir Trust in Fort William, judging gear for awards in Friedrichshafen) I wanted – needed - time outdoors. An afternoon beckoned. The forecast – heavy rain, some sun, breezy. Large pools on the wet road as I drove to the Sugarbowl car park showed the first was certainly true. The last would be welcome to keep off the midges. I’d already had my first bites of the year in Fort William, waiting for a bus. The sun I could hope for. 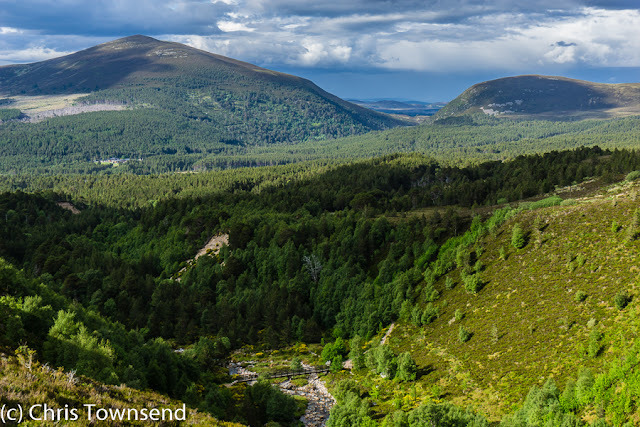 North of the Cairngorm Plateau a cluster of lower hills overlooks Rothiemurchus and Glenmore Forests. Little frequented these are excellent viewpoints and make for a good short walk. 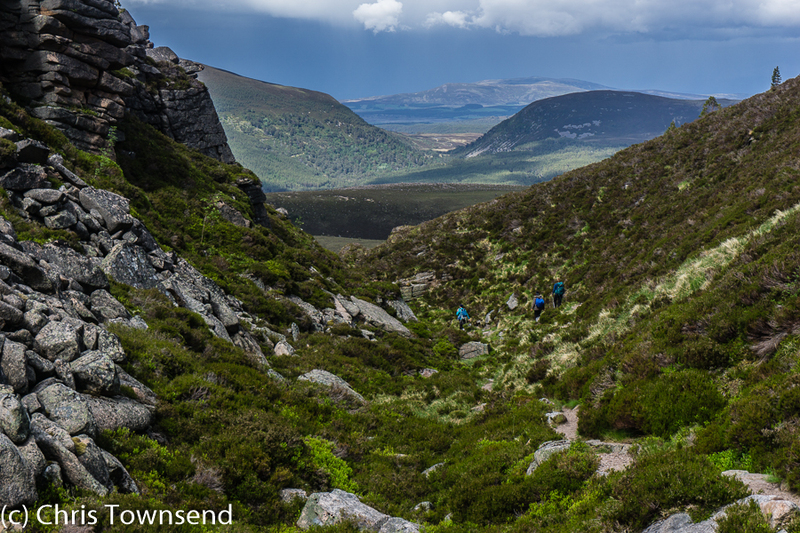 I went to them through the rocky chasm of the Chalamain Gap, meeting the only people I saw heading down, before turning up the steep though easy slopes of Creag a’Chalamain. The sky was a shifting pattern of dark dense clouds backlit by the sun, patches of brilliant blue, and shafts of sunshine. I watched rain sweep across the hills in grey waves. 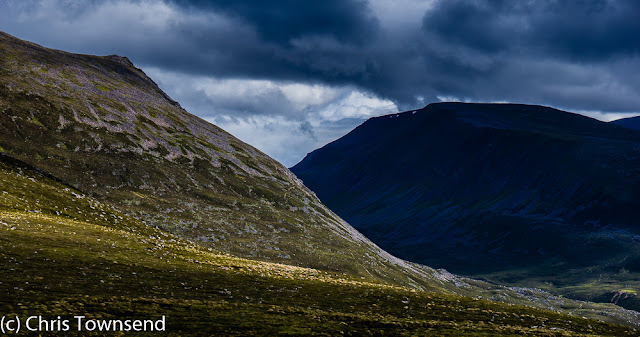 On the path above the Allt More I walked in a strip of sunlight with clouds rushing over the high Cairngorms on one side and Strathspey on the other. I only caught the edge of the rain – and once hail – a couple of times. There was a breeze, strong on the tops, but it wasn’t cold. The light was wonderful, constantly changing, constantly highlighting different aspects of the landscape. The wet rocks and vegetation glowed. I looked over the rich green forest to the dark eye of Loch Morlich and the tiny smudge of Aviemore then turned to look at the dark outlines of the big hills, still streaked with the last snow. 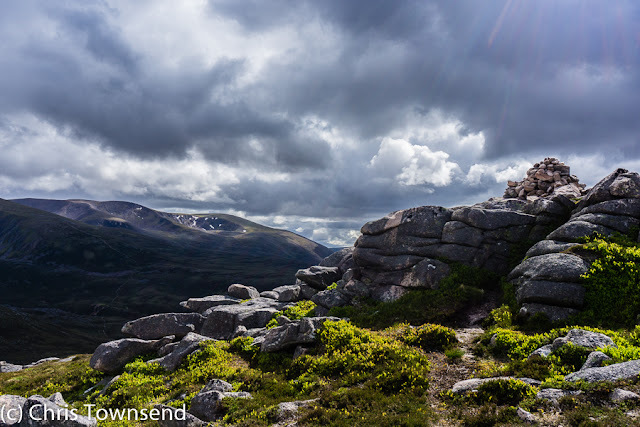 Over Castle Hill and Airgiod-meall then back to the path, the Allt Mor and the car. Golden plovers whistled mournfully from the sparse heather. A cluster of grouse chicks squeaking loudly exploded upwards from under my feet. Their mother scuttled across the ground, wings held out as if broken, luring me away. Finally satisfied I was no longer a threat she took to the air and made a long low curve back to her chicks. The bright green vegetation, the warm sunshine, the warm rocks. It felt like summer had begun. 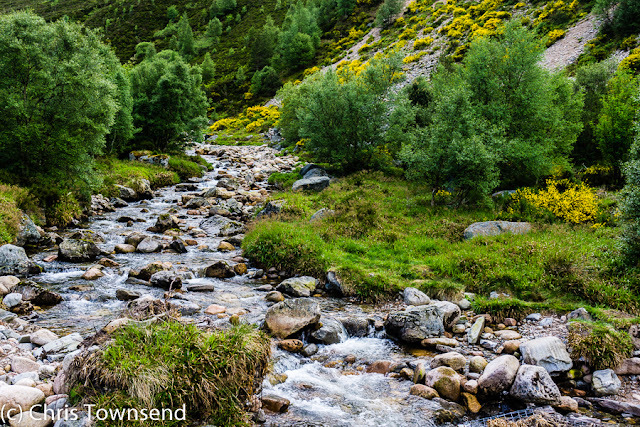 I'm recovering from a back injury sustained in May and I'm spending a few days in Aviemore. It was time to get out and see how my back faired on some rougher terrain and this route seemed deal. I thoroughly enjoyed it but kept out of the reindeer enclosure on Airgiod-meall as I had Meg, my border collie with me. I did however spot a female with her new calf, a lovely and unexpected sight. Keep up the great writing and a donation is on its way. Thank you for your generous donation. I really appreciate it. Glad you had a good walk. Hope your back recovers soon. You are very welcome.....my back is on the mend and looking forward to the Dolomites in July.